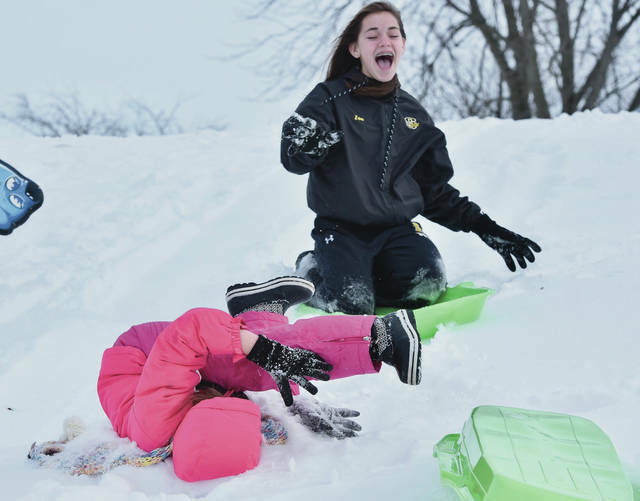 Aubree Frock, front, 8, daughter of Travis Frock and Amber Mayse, of Sidney, takes a tumble while sledding as Zoe Overholser, 14, daughter of Sherri and Mike Overholser, of Sidney, watches. Aubree was unhurt in the fall. Also sledding Tuesday, Jan. 22, was Aubree’s brother, Anthony Frock, 10. The small hill is located along Main Avenue.